Add special education costs to the list of things crippling California school district finances. State and federal funds for students with disabilities aren’t keeping up with districts’ increased special education costs, leading districts to put increasing amounts of their general fund towards those services. At San Diego Unified, the amount of local funds contributed to special education increased nearly 65 percent between the 2012-2013 school year and the 2016-2017 year. San Marcos Unified’s local revenue contribution during that time has increased by 67.5 percent. Oceanside Unified said its special education expenditures are rising at the same rate as pensions and healthcare costs. That increase is happening at a rate of about $5 million per year. Poway’s contribution has nearly doubled – a 98 percent increase. Oceanside Unified’s general fund contribution has more than doubled, seeing a roughly 137 percent increase. Grossmont Union saw a nearly 110 percent increase over the past five years. Chula Vista Elementary’s local revenue contribution has also more than doubled at a roughly 103 percent increase. Sweetwater Union and Vista Unified have seen the steepest increase of nearly 160 percent, from 2012-2013 to 2016-2017. Those skyrocketing costs mirror a trend around the state. In the 2005-2006 academic year, California schools reported special education expenditures of roughly $8.5 billion. In 2015-16 that had grown to about $13.2 billion. That’s a 55 percent increase in 10 years. Both the number of students with disabilities and the average cost per special education student have been rising. Some parents and staff say budget cuts  left the district with a high number of vacancies in special education at San Diego Unified this academic year, leaving parents, principals and staff concerned for the safety of special education students. District officials floated the possibility of reducing up to $5 million in non-mandated special education spending in a budget survey  sent out to parents and other stakeholders. At San Marcos Unified, district leadership says it is losing money every year and the three main culprits of its precarious fiscal situation are pensions, healthcare and special education. “We want to provide the best special education services that we can because we know that these children deserve it,” said San Marcos Board Trustee Randy Walton. Walton said the gap between what the state and federal government give San Marcos Unified for special education and what the district needs to spend accounts for more than 10 percent of the district’s entire budget. In August, Poway Unified presented its board with a report  evaluating its special education program. It found that the district received less than half of what it needed for its special education expenditures from state and federal funds specifically mandated for students with disabilities. But increased spending does not seem to be producing better outcomes. Throughout the state, students with disabilities remain one of the lowest performing student groups , with lower test scores and graduation rates and higher suspension and expulsion rates. Yet, when the state revamped the way it funded districts several years ago, students with disabilities were not taken into account, unless they happened to fall into another vulnerable category, such as being low-income, homeless or an English learner. Not only are there more special needs students, the cost of educating each one has gone up. However, state funding for special education has been falling, dropping from a peak of $3.8 billion in 2007 to $3.2 billion in 2014. On a per-student basis, special education funding fell from $4,900 to $4,478 in inflation-adjusted dollars in that time period, according to a report  from the Public Policy Institute of California. These costs are averages and in special education, there is a wide disparity on what is spent on each child. Providing services to a child who can mostly be in a general education classroom, but needs an hour or two of special services like speech therapy, costs closer to what it costs to educate a student without a disability. But there are rare cases where school districts will pay upwards of $100,000 a year for students with more severe disabilities to be in residential programs out of state because that is the only thing that can serve that child’s needs. Poway Unified estimates it costs about twice the amount on average to educate and provide services for a student with disabilities than a general education student. Oceanside Unified said a special education student costs an average of $6,500 more than a student without a disability. At Oceanside, between the 2012-2013 and 2016-2017 academic years, per-student spending for special education rose by nearly 35 percent. Grossmont Union saw a nearly 25 percent increase. Sweetwater has had a roughly 31 percent increase and Chula Vista Elementary, a 33.5 percent increase. San Marcos Unified and Vista Unified saw the biggest surges of 42 percent and 45 percent respectively, both from around $11,000 per student in 2012-2013 to more than $16,000 in 2016-2017. San Diego Unified and Poway had the smallest per-student expenditure increases, with 19 percent and 8 percent increases respectively. Poway’s Associate Superintendent of Business Support Services Ronald Little said it’s difficult to compare costs across school districts, since they may include different things in their special education budgets, but offered some insight as to why Poway’s per-student costs may have increased at such a lower rate than other districts. He cited decreases in transportation costs the district has managed through better planning and an 18 percent decrease of students in outside agencies, like nonpublic schools  or nonpublic agencies, where outside organizations either can take students on full-time or provide services to students with disabilities if their school district cannot provide them with what’s needed. For instance, between 2012-2013 and 2016-2017, Oceanside’s costs associated with these outside programs rose from $1,372,195 to $2,066,013 . That’s about a 50 percent increase over five years. Since 2013, the number of San Diego Unified students attending nonpublic schools has also been steadily rising . The district paid roughly $11,864,113  in nonpublic school tuition in 2014-2015, according to records obtained through a public records request. In 2016-2017, that number rose to $14,987,051 . That’s about a 26 percent increase in three years. Little also said while he’s not familiar with the specifics of employee pay and raises at other districts, Poway has been conservative in providing salary increases to teachers and staff, which may also be a factor. Per-student special education costs are rising for several reasons, according to Anderson and officials from several local school districts. First, rising employee costs, like pensions and healthcare, are also the largest portion of the expenditure increases in special education budgets. Second, Anderson said, in 2011-2012, a state law went into effect that gave schools the responsibility to provide mental health services to students with disabilities. Before this had been provided by counties. With the shift came the additional cost added to district budgets. Finally, both the number of students with disabilities and the number of students with more severe disabilities has been on the rise. While general enrollment at most districts in the state has been declining, the number of students with disabilities has increased statewide by roughly eight percent between the 2005-06 academic year and 2015-16, Anderson said. Excluding the students with the most common – and typically, less severe – disabilities, which include speech impairments and a category called “specific learning disabilities” that includes conditions like dyslexia, the number of children identified with all other disabilities increased by more than 50 percent between 2005-06 and 2015-16, Anderson said. More severe disabilities that districts are seeing more frequently, like autism, often require additional one-on-one aids, occupational therapists and other specialized positions. Anderson said statewide there has been increased employment in these types of jobs at school districts by about 20 percent between 2005-06 and 2015-16. The governor’s current draft budget includes one-time funding that could be used for special education for children up until age five. Oceanside Unified’s special education director, James Wood, said additional money to do this would be welcome. Anderson cautioned that these funds are still vague and there is no requirement that districts use them for special education. There are also additional funds outlined in the draft budget proposal to help with hiring and training special education teachers. However, Anderson and several local district special education directors say that the shortage of teachers and staff in special education is a separate issue from districts’ special education funding woes. The difficulty in special education staffing may actually be keeping districts’ costs lower. Little said Poway, for example, has traditionally had a difficult time staffing all its aide positions in special education classrooms. “Each year we ‘write off’ hundreds of thousands of $$$ of ‘vacancy savings’ related to these and other unfilled positions,” Little wrote in an e-mail. The two largest districts in the county, Poway and San Diego Unified, reported vacancies of 114 and 100 aide positions, respectively, in November. Trying to cut back costs on special education can be precarious. In an extreme example, the state of Texas had a cap on the number of students in special education – something educators in the state say the state’s legislature imposed to cut costs , according to the Texas Tribune. Michelle O’Connor-Ratcliff, a board trustee for Poway Unified, said the district has a committee of special education teachers and other staff to look at ways to alter service delivery. Some of the changes, O’Connor-Ratcliff said, have been easier, like regionalizing transportation services for special education students. That caused the district’s transportation costs for students with special education to fall by about $2 million between the 2012-2013 academic year and the following year. They’ve remained flat since. Poway’s special education executive director Doyan Howard also said the district is using something called “response to intervention,” a form of teaching low-performing students that is supposed to help distinguish why exactly a child is struggling. Identifying students with disabilities can be challenging. 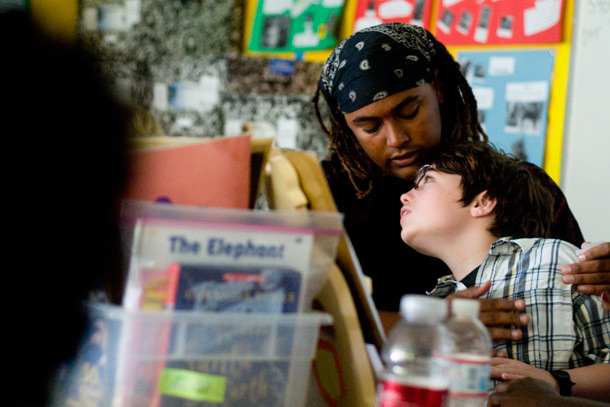 San Diego Unified, for example, has been trying to address the over-identification of African-American students and English learners as having disabilities . Indeed, ensuring that students without disabilities are not being put in special education is important both for the children themselves and for school districts’ resources, but it’s also a method that can swing in the wrong direction. In the Texas case, for example, the Houston Chronicle discovered that “response to intervention” methods were used to keep kids with disabilities from receiving special education services . San Diego Unified implemented a change in its moderate-to-severe special education classrooms that went into effect this academic year. Before, every school had to provide a classroom and teacher to any student with severe disabilities. That meant some schools had a classroom with only a couple of students in multiple grades. The district consolidated those classrooms in each cluster, so there would be more students who could be with their peers, rather than, for example, just a fifth grader and a first grader in one classroom. The switch has caused some transition pains  and not all parents and employees are happy with it. Leo Marchena spent eight years as an interpreter at a school district in San Diego County in meetings between staff and parents of students with disabilities, where they discussed what services a child with disabilities needed to reach their academic goals. Those meetings are where students’ Individualized Education Plan – an outline for students with disabilities to achieve their goals that also mandates what districts need to provide them – are written, revised and updated. What he saw in those meetings frustrated him. He eventually left that job to become an advocate that works with parents of students with disabilities . Between his time as an interpreter and his time as an advocate, Marchena said to him, it’s clear that money plays a big role in districts’ decision on how to provide services. Marchena said it also leads to inequality within special education. The parents who know their child’s legal rights and have the resources to hire advocates and lawyers can get the services and resources needed from districts. The dynamic often means that students with disabilities who come from socio-economically disadvantaged backgrounds may be less likely to get needed services, he said. At the end of February, the state Assembly and Senate Committees on Education will have a hearing  on AB 602, the biggest source of state special education funds – a potential indicator the legislature could revisit the way the state funds special education. But Anderson warns districts that they may not end up as winners if there is state-level reform to special education funding. The situation has San Marcos Unified Superintendent Melissa Hunt frustrated. Her district is in a pattern of deficit spending, she said, and not just because of special education.